As you know from my post yesterday (I'll assume you read it), Adam Lind cards are selling a bit high these days because of how he has started the season off. I just got in the mail today what I think will be one of the last 2 bargains I end up with since I bought it a week or so ago. 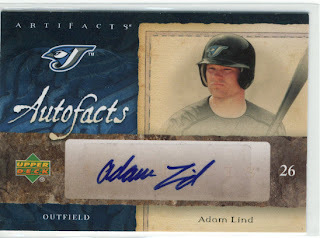 My bargain card is a 2007 UD Artifacts Autofacts Adam Lind, which cost me $3 as a buy-it-now. 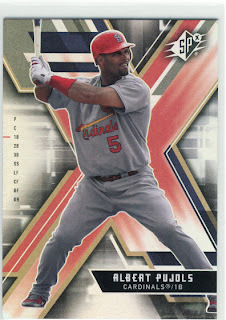 Luckily for me the same seller had 2 Albert cards that I needed, a 2005 Donruss Zenith and a 2009 UD SPx base card. $1 each to sweeten the deal, and make me a happy camper. 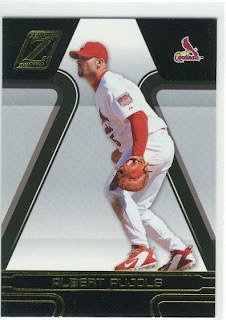 As far as Adam Lind cards go, there is only one that I really want that has not come by my hands yet. It's his 2005 Bowman Sterling GU Bat/Auto card. I have a story for why I don't have it, and I will make it short. About 2 summers ago I purchased this card on eBay for $8 delivered. The guy had this whole story that the boat didn't pick up the mail and his wife was lazy. I wish I were kidding. There is a post about this in the archives I believe, but the story that this guy came up with was so ridiculous you would have thought he lived in one of those tiny Fischer Price towns, there was a boat, a goat, an old lady in a shoe, etc. So I never saw that card, but got my money back after a long battle on trying to get the GPS of said boat. I may try and go after another one, but I am really not willing to pay much for it. If he pans out, and this isn't just a fluke start then maybe I'd consider paying more but for now I am still going to be Scrooge McDuck. Are you going to the home opener on Thursday? Sooz and myself will be going to the game together on Thursday. Should be a cool ceremony pre-game, and I am hoping to see some of the old timers there for it.